It’s very common to use the Internet these days. It has become one of our basic needs. There is no home without the Wi-Fi connection, and people prefer to go to Cafes or Restaurants having Wi-Fi. Premium cab services like Uber and Ola providing free Internet via Wi-Fi and one of the most important fact, that the sole reason behind Reliance to provide free Internet and Calls via Jio 4G is like a cherry on top. When we talk about the Internet, it is flooded with thousands of different websites with tons of information and entertainment that one can enjoy. It’s like the Internet is the biggest and the most used medium for collecting information about each and everything. I mean, there is a high number of young entrepreneurs and artists who owe their success and knowledge to Google Search and YouTube. But that doesn’t conclude that all the information mentioned on the web is accurate and authentic, and you should believe or follow this news and data. Now, when we visit any site, we don’t think how appropriate or inappropriate the content is. It’s not necessary to be true and hence, we should be aware enough when we rely entirely on the Internet. Thinking about this, 12 years ago, on June 23, 2005, a group of University of Virginia roommates created a website called Reddit. Their names were Steve Huffman and Alexis Ohanian. It was initiated with an intention to provide social news and web content analysis. It is now mainly a forum and discussion community website people can analyze the content available on the Internet and check the social news statuses. A certain number of groups of people who got registered on this site, and they are the ones who can submit the actual content required based on their choice of interests and field of expertise. These Registered users can submit their votes, organize the way posts are displayed and determine their respective positions on the pages of sites’ list. Registration for an account on Reddit is free. Reddit users are known as Redditors. Users also have the freedom to create their subreddit. Sometimes, when you use this site, you see a lot of deleted comments. Hence, it is necessary for us to know how to access deleted comments from this site so that it doesn’t hinder our work. Let’s see how each of them work. Ceddit is wholly a powerful and beneficial tool. It considers you as the regular user and allows you to browse through the content. It also allows you to browse through all the deleted comments. It is a bit slower than Reddit. One dedicated Google Chrome extension has also been introduced which is integrated into a website that saves a cached copy of all the current Reddit pages opened in your browser. You can then view the copy that has preserved all the comments that you need to watch later. You can watch all the unedited and deleted comments of the current page without any hassle. Visit its website UDRC for more detailed information regarding this browser extension. It is one of the simplest tools one can try for this restoring purpose. It doesn’t have a real interface. All you need to do is add ‘un’ to ‘reddit’. 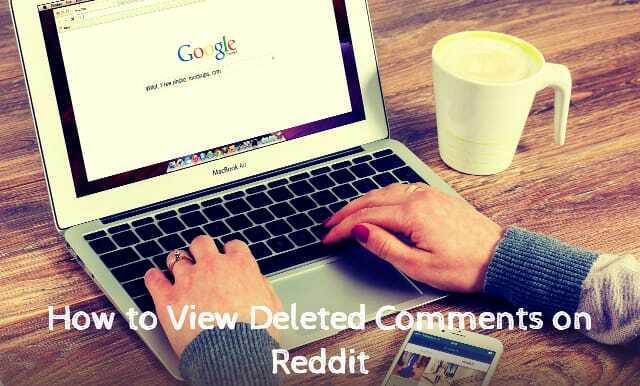 It will recover all your deleted comments and show you all the content available. When you change the URL, all deleted comments appear. They are highlighted in red. You can switch back to original by clicking on the link again. This one has a different way of working. When you use this tool, it doesn’t recover all the deleted comments rather only deleted comments of maximum 1000 characters length. It is very useful at times. Even though you might feel this ratio isn’t well suited, but it is when you need only an anecdote or a single line. Hence, these were various methods to access deleted comments on Reddit quickly. Do share your comments and thoughts if you’ve tried any of these methods or tools. Let us know if you have any other information and process related to this post. Cheers!